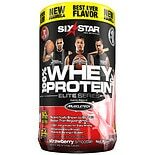 Shop Labrada Nutrition Lean Body Hi-Protein Meal Replacement Shake Powder Strawberry (39.52 oz. )39.52 oz. $3699$36 and 99 cents$0.94 / oz.